Usually when the name “Frank Thomas” comes up these days one thinks about “The Big Hurt” who spent 18 seasons in the major leagues, mostly for the Chicago White Sox, and who retired in 2010 with Hall-of-Fame credentials: .301 lifetime BA; 521 hrs; 1704 RBIs. 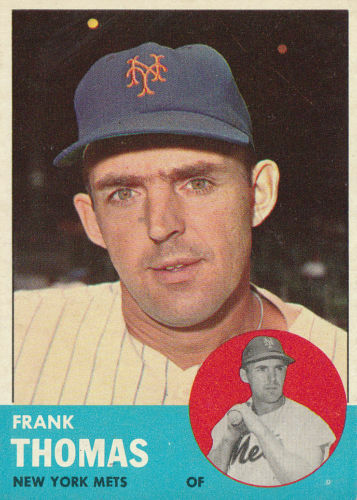 But years ago there was another Frank Thomas, whose nickname was “The Big Donkey.” The Big Donkey played for a host of clubs over 15 big league seasons and the numbers he put up upon his retirement in 1966 were very respectable: .266 lifetime BA; 286 hrs; 962 RBIs. Thomas was a member of the inaugural Mets teams in 1962 and 1963 and led the Mets in HRs in 1962 with 34, a record that was not broken until Dave Kingman hit 37 in 1976. Thomas always wanted to be an airline steward and to this end he would don an apron and help serve in-flight meals on the Mets flights. Long time United Airlines stewardess, Barbara Mueller once said of Thomas, “Outside of this girl, Jane, who handles first-class on our New York to San Francisco Champagne flight, I think that Frank Thomas is the best stewardess on United Airlines.” Of course at one time in America it was not considered inappropriate to use the term stewardess. Thomas, it was said, could catch the hardest throw of any player and do this barehanded. Willie Mays once accepted the challenge and lost. The genesis of this talent is that Thomas’s parents could not afford a glove for him – he grew up at the tail end of the Depression – and he had to learn to catch a ball with his bare hands. Thomas was well-known for abstaining from night life while on the road. Instead, The Big Donkey would spend his time in his hotel room reading and answering fan mail. That in itself sounds positively archaic by today’s solipsistic standards. From 1941 – 1946 Thomas trained to be a Roman Catholic Priest. He apparently had a change of heart at some point ( maybe it were his aspirations to become an airline stewardess), married and became the father of eight children. The photogenic Thomas family – large even by the standards of the 1960s – became a favorite subject for local photographers wherever Thomas played, particularly in New York. Maybe Thomas’s greatest stat is that he remains married to his wife of 60 years. I guess he really did stay in his room and answer fan mail after all.